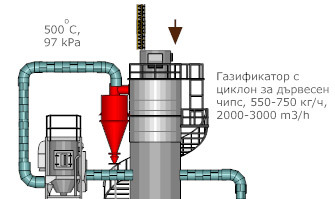 Gasification of dry plant biomass is a process of incomplete combustion, in which three zones are formed the reactor – oxidation, reduction and area of drying the fuel. In the oxidation zone the combustion products are carbon dioxide CO2 and water H2O with temperature of 1000 to 1200 C0. In the reduction zone these gases are reduced to carbon monoxide and hydrogen through the following reactions: CO2 + C = 2CO; H2O + C = CO + H2. In both resulting products of combustion and reduction, tars and resins from the pyrolysis process are produced. They consist from a mixture of formic, acetic acids and phenols from incomplete digestion of lignin. The tar within the reduction area is decomposed to very extent by oxidation and cracking. Thus, the correct selection of construction of the reaction chamber is the key for low quantity of tar produced in source gas, which determines and the burning regimes, the purification of the gas output and long life of the installation.